Black Friday and Cyber Monday has now been stretched to being a week long which makes bargain shopping easier. There are programs that watch Amazon for the particular items you want to buy like camelcamelcamel (sends alerts) or a browser add on that will tell you the items price history, Honey (and lists best buys of the day on their website) and if an item is the best buy of all the sellers, but there is a movement to make Christmas less about commercialized consumerism, and more about celebrating the reason for the season. Here are some ideas of traditions you may want to establish. The Four Gifts For Christmas, each child will get 1) something they want, 2) something they need, 3) something to wear, and 4) something to read. It helps keep it simple for everyone makes less mean more. The Giving Manger Create something that will serve as a manger to receive the Baby Jesus on Christmas day. Have a separate container of straw. Every time a person does a hidden act of kindness, they can take a straw and place it in the manger. It is a great Advent practice. Box of Joy Have a child fill a shoebox full of little toys, school and art supplies, hygiene and clothing items with a note to give to a child to bless them with a gesture that someone cares. Information on what to pack and how to send can be found here. 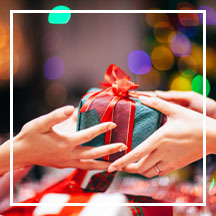 Adopt a Family Contact St. Vincent de Paul to volunteer to provide Christmas gifts for a family in need. Volunteer as a Family Serve at a soup kitchen, pack meals at Feed My Starving Children, Make and decorate cookies and visit a senior center and sing some Christmas Carols. Make Personal Donations Have a child choose what toys to give for others to enjoy. Older children can be challenged by giving them seed money at the start of Advent, with the task of increasing the money like savvy entrepreneurs. Secret Santa Put the family members names in a hat. Each person chooses who they will select and wrap a gift for anonymously. In addition, each family is to write a note of affirmation, appreciation and love for each member, signed, of course. Here is a bonus idea for birthdays! Have a tradition of giving two specially wrapped or decorated boxes, the first one given is the gift of responsibility that is expected at their age that is appropriate for that child, such as a household chore, and the other is the gift of privilege, e.g. being able to stay up later. The goal is for the child to master all home appliances (dishwasher, laundry, etc.) before they are ready for the responsibility of driving a car. Bottom line, we want to be more about giving the gift of our time and attention, creating memories and traditions, and we want children be grateful the gifts they receive like this cute little girl. Fourteen Days of Healthy Holiday Treats!